With the election just weeks away, Reform California today released government documents and records showing numerous examples of “epic levels” of waste, fraud and abuse of gas tax funds and other taxpayer resources at Caltrans and local transportation agencies throughout California. The records and documents were obtained through the California Public Records Act (CPRA) process – and cover only materials received back from the CA Dept. of Transportation (Caltrans), local transportation agencies in San Diego, Los Angeles, Orange County, the Bay Area, and Sacramento. Other local government agencies also receive and spend gas tax funds – raising the question of how many more examples of waste of gas tax funds exist. 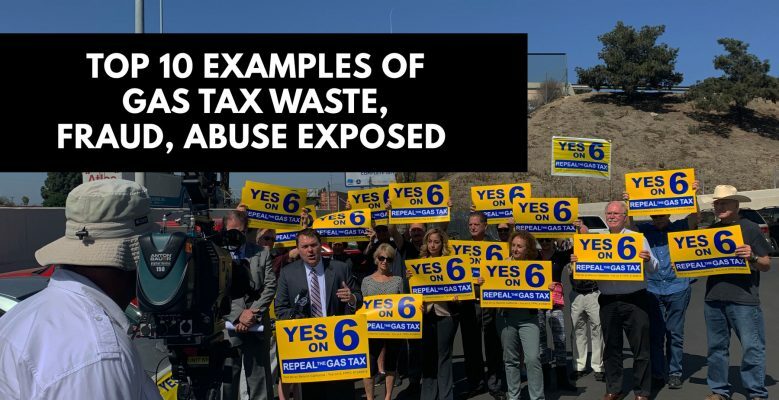 “Our existing gas tax funds are being wasted and we demand that these revelations of outrageous expenditures be immediately reformed before we give these people any more of our taxpayer dollars,” noted DeMaio. Just how much do these signs cost taxpayers? OCTA issued a “Change Order” for the I-405 freeway project signs that led to a cost increase of $32,644.25 – or a total cost of 6,528.85 for EACH sign! The contract plainly states that it only includes the design, production, and installation of five roadside signs that said “OC-GO ‘Your Tax Dollars at Work’” and also included the SB 1 logo. #2: Gold-Plated Transit Buses Costing 3-5 Times National Average – That Break Down! Several local transit agencies receiving gas tax funds have been caught with champagne and caviar bus appetites – paying three, four, and five times the cost of the average new bus price. Instead of purchasing and running natural-gas powered clean buses at a cost of roughly $300,000 each, San Diego MTS has decided that political correctness demands they pay hundreds of thousands MORE or 3 times more per bus for all-electric buses – or $900,000 each! Los Angeles Metro is paying more than five times the expected cost per bus! Instead of purchasing and running natural-gas powered clean buses at a cost of roughly $300,000 each, LA Metro has decided that political correctness demands they pay $1.65 million per bus for all-electric buses! LAMTA purchased these all-electric buses despite numerous documented performance problems found by LAMTA staff when they conducted a pilot project with 5 of these all-electric buses. A LAMTA board report stated, “The operating performance of these initial prototype buses did not meet Metro’s daily operational requirements – and after a full year of operation were removed from active service.” The same LAMTA board report stated the buses had “limited range between charges and poor hill-climbing ability severely limits the lines on which they can be operated…the buses have also experienced low reliability.” Despite all of these red flags, LAMTA used a “non-competitive” contract process to purchase more of these costly, performance-plagued buses. But hey, at least it is politically correct to be all-electric and the gas tax hike can cover the excessive cost! In just the agencies selected for this review, an astonishing percentage of individuals are earning over $100,000 a year in compensation – at a time when the median income in California stands at just $$32,482 per capita. While it certainly is expected that some executive-level employees would earn six-figures, the astonishingly high percentage of total employees in the $100,000 Club is excessive. Sacramento Regional Transit District: Sacramento RT has 39% of its employees earning $100,000 – for a total of 396 employees. San Francisco Department of Public Works: The SFPW has nearly two-thirds (63%) of its employees earning $100,000 or more with the average compensation of all employees at $114,736. San Francisco Municipal Transportation Agency: The SFMTA has more than two thirds (66%) percent of its employees earning $100,000 or more with the average compensation of all employees at $118,592. A total of 3814 employees earn $100,000 or more. San Jose Department of Public Works: The SFPW has more than half (51%) of its employees earning $100,000 in compensation or more – with the average employee earning $102,017 a year. The San Jose Director of Transportation pulls in $460,671. Santa Clara Valley Transit Authority (VTA): The VTA has sixty-four percent (64%) of its employees earning $100,000 or more – with the average employee earning $114,335. 1545 VTA employees pulling in $100,000 or more is more than the number of actual busses run by VTA! Golden Gate Bridge, Highway and Transportation District: The GGTA has 71 percent of its employees (860) earning $100,000 or more – with the average employee earning $120,286. Los Angeles Department of Public Works: More than one-out-of-three employees at LADPW earns $100,000 or more per year – with 1941 LADPW employees pulling in $100,000 or more. LADPW has more members of the $100,000 Club than crews assigned to fill potholes! Los Angeles Metropolitan Transit Authority: More than forty-two percent of employees at LAMTA earns $100,000 or more per year – with 4476 LA Metro employees pulling in $100,000 or more. LA Metro has more members of the $100,000 Club than actual buses in its fleet! LA Metro CEO Phillip Washington is pulling in a cool $425,016 a year in compensation. Santa Clara Valley Transit Authority (VTA) has three bus drivers that are paid over $200,000 in compensation – including Roy Stokes who pulled in a whopping $205,252. Almost half of VTA’s bus drivers earn $100,000 or more in compensation a year. At LA Metro, over 655 bus drivers make more than $100,000 in compensation each year including one, Jose Lara, who earns a whopping $174,308 in compensation each year. San Francisco Municipal Transportation Agency has a Transit Car Cleaner earning $158,075 for the top earner – with 76 Transit Car Cleaners earning over $100,000! Golden Gate Bridge, Highway and Transportation District paid bus drivers Patrick A Depalma $227,181 last year and Raymond C.W Woo $204,307 this year. Report to HR! Jeffery Stumbo serves as the San Diego MTS HR Director. Despite the fact that MTS only has 194 employees, “Jumbo” Stumbo earns a shocking $276,175 in compensation each year – that works out to be an indefensible $1,423.58 per employee HR file he maintains. Executive Assistants: OCTA (Orange County) is paying an Executive Assistant $173,808 in compensation each year – and six Executive Assistants are making $100,000 or more each. At Sacramento RT we found an Executive Assistant earning $124,480. San Francisco Department of Public Works pays an Executive Assistant $123,812. The Platinum Plumbers: Andrew Rella, a LA Metro plumber, is being paid $169,113 in compensation. San Francisco Department of Public works has a plumber earning $173,170 while San Francisco Municipal Transportation agency has a plumber at $188,336. Didn’t They Check Angie’s List First?! San Francisco DPW is paying a Bricklayer: $142,928, a Painter: $139,695 and a Carpenter: $131,640. The San Francisco Municipal Transportation Agency pays a simple automotive mechanic $190,376! Golden Gate Bridge, Highway and Transportation District pays a dispatcher $182,849 a year and a bridge painter $178,856 a year. It wasn’t just Caltrans that went on a spending spree on these items. Orange County Transportation Authority authorized $240,000 for office furnishings and reconfigurations. SFMTA spent $25,000 for the purchase of one fancy conference table. Massage Therapy: Gas tax funds were used to pay Holistic Exchange, Inc $300 for massages for 12 staff members in Merced County. Lavish Parties: In early 2018, San Diego MTS celebrated the gas tax implementation with purchase orders including $7474 for a party at the exclusive Symphony Towers for MTS executives – including $780 in floral arrangements. They also got caught with their hand in the cookie jar $3200 for a one-time purchase of “cookies,” and $5800 for yet another fiesta that included tacos at $8 for each taco! Ay caramba!